Pair with your favorite boho-chic outfit, and let the compliments roll in. Some of the manicures backstage at New York Fashion Week may take an army of nail techs, hundreds of beads, and a prayer, but not the fun and edgy design at Rebecca Minkoff! 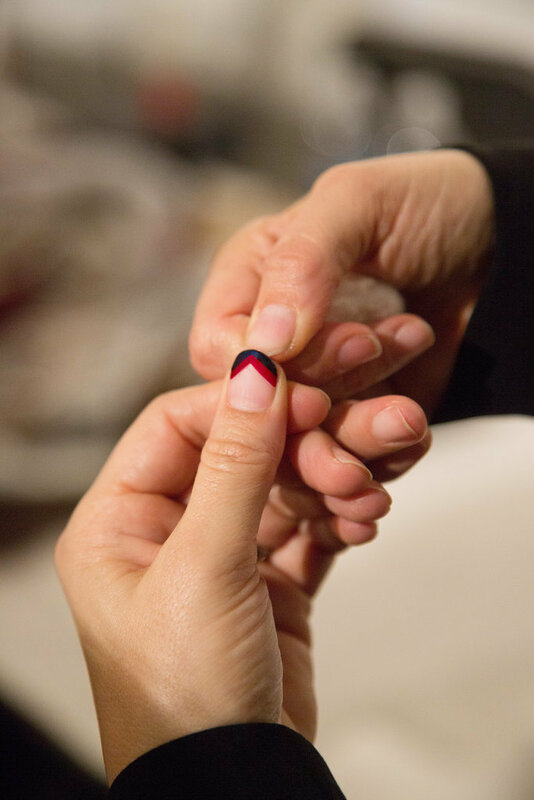 The stacked chevron look is so easy, even a nail art newbie can re-create it at home (we promise). Minkoff's Fall 2015 collection was inspired by Patti Smith's memoir, Just Kids, which depicts bohemian life in 1970s New York City. Minkoff — who is now Essie's official Global Color Designer — selected oxblood and sapphire as two of her key hues, so lead manicurist Michelle Saunders incorporated them into this fun and funky pattern. 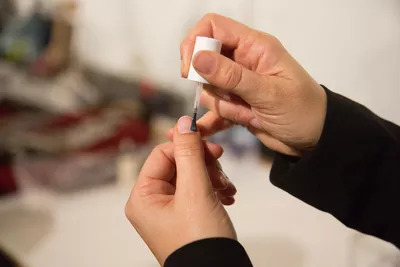 Michelle broke down the Essie look for us — read on for the simple steps! Step 1: Create your negative space. After applying one coat of Essie First Base Base Coat ($8), add a layer of EssieMademoiselle ($9), a sheer baby pink. Step 2: Draw your first triangle. Once the polish dries, use Essie Berry Naughty ($9), a creamy oxblood, to make half of an “X” on the nail. Not convinced you can keep your lines straight? Never fear! “You need to anchor your hand,” explained Saunders. Once you anchor your painting hand on a steady surface, “your brush does all the work." Step 3: Apply your second angle. Using Essie Midnight Cami ($9), a metallic sapphire, paint the same design a brush-width away from the edge of your maroon chevron. Ta-da! Seal your fashion-forward design with Essie Good to Go Top Coat ($9). Pair with your favorite boho-chic outfit, and let the compliments roll in.